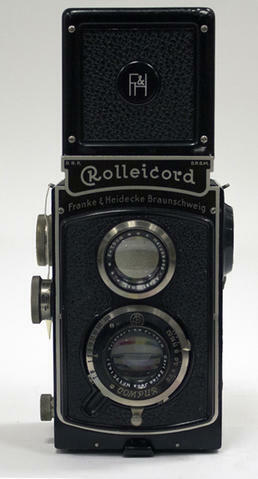 Item is an inexpensive version of the classic Rolleiflex medium format, twin lens reflex camera with fewer features. Shot 6 x 6 cm exposures on 120 film; adapters could be obtained to shoot with 35mm and sheet film. The lens is a Zeiss Triotar f 3.8, 7.5cm with a 28.5 filter screw mount.